Great news - we've been rewarded with a fabulous 9.1 out of 10 by Booking.com in their annual Guest Review Awards 2018. A big thank you to all guests and customers for your kind comments and reviews which have pushed us to achieve this top mark in an international field. We're working even harder in 2019 to make your stay as comfortable and enjoyable as possible. Why not treat your Dad and book up a table for a relaxing lunch or supper. We're serving food from 12 to 2.30pm and then from 6 to 9pm in the evening. The Bar's open from 11.30am to 11pm. It promises to be a busy day so please give us a call to make your reservation. The King William recently sponsored both the 7th Hole and 'Nearest the Pin' at a special charity Golf Day in aid of the RNLI at Hunstanton Golf Club. We also put forward a team comprising - from left - Mike Witley, Nigel Bishop, Nick Skerritt and Jez Hyland who came a tremendous 4th out of some 30 teams. A great day was enjoyed by all and well done to the KW Team! Here comes summer and we're all set with the arrival of our new 2018 Summer Menu. Packed with top quality local produce and ingredients, our latest offering brings an extensive range of tasty, sunny dishes brimming with flavour, freshness and surprises. Let our chefs tempt you with their innovative creations and our delicious, traditional pub classics. We offer a wide range of vegetarian dishes and fun choices for the littles ones too. Relax and enjoy your meal in one of four relaxing dining areas, or step out into the garden with the shade of our charming Pergola for those warmer, summer days. It's always best to book at holiday time to guarantee a table. Please call 01485 571765 for reservations. This is to advise that Anglian Water will be carrying out drainage works in Sedgeford from MONDAY 12 FEBRUARY for 2/3 weeks. Access to Sedgeford from both the Snettisham Road and Heacham (via Norfolk Lavender) will not be available during this period. Access from the Docking/Fakenham/Fring direction will not be affected. From the A149 lights at Heacham/Norfolk Lavender continue towards Hunstanton for 250 yards and turn next right for RINGSTEAD. Follow this road for 2 miles and at the end T-Junction turn right for SEDGEFORD (2 miles). On entering Sedgeford via the Ringstead Road, turn right and the King William is immediately on your left. Our full car parking is available as always. Sorry for any inconvenience caused. Sincere thanks to all our guests and customers for your kind comments and reviews which have enabled us to achieve this award. We look forward to welcoming you back soon. Congratulations to our Sous-Chef, Simon Biggar, who was a Finalist in the inaugural National Breakfast Awards held in London on 30th January 2018. Simon made a delicious Beetroot, fruit and ginger smoothie and homemade scotch eggs, baked beans and potato bread for his signature breakfast. Both creations obviously impressed the judging panel as Simon attained a tremendous 'joint second' in the competition. 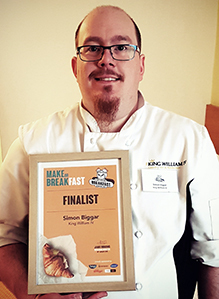 Well done, Simon, and please do call in and sample our award-winning breakfasts very soon! We're looking forward to Chef, Simon Biggar, competing in the National Breakfast Award cook-off later in January. We'll keep you up-to-date. Good luck, Simon! Claire Scollay will once again be performing a variety of swing, soul & Jazz on Saturday 18 November in the garden restaurant 7pm-9pm. those dishes you have always wanted to try at unmissable prices. 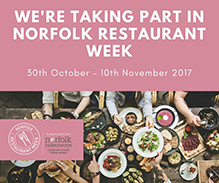 Norfolk Restaurant Week runs from Monday 30th October - Friday 10th November. Available for lunch Tuesday - Friday and for dinner Monday - Friday. We have a very special early Christmas gift for you - an exclusive photographic exhibition of Norfolk and other mysterious places by celebrated local photographer David Morris. Delight in a hearty, home-cooked family meal in our gallery restaurant while admiring the stunning photographic works adorning the walls. 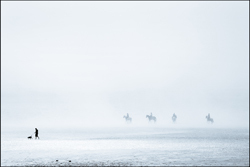 Sea Horses & Other Stories comprises a series of remarkable images, together with the unique stories behind them, from the Household Cavalry on their yearly jaunt up to Holkham, to the result of a daring paddle in a canoe up a quiet Norfolk waterway. David prides himself on exploring the places that are a bit out of the way, and sometimes a little tricky to reach. Well done to Chris Marshall & his fabulous Kitchen Team for their excellent professionalism in food hygiene. Top Score once again! We're already taking bookings for the festive season, the restaurant is booking up quickly for Christmas Parties, Christmas Day & New Years Eve, so please book today to avoid disappointment and enjoy a delicious dinner and toast the festive season in style. Throughout September we hold our Monday Quiz-night as usual with an 8.30pm start, everyone is welcome. Don't forget about our Tuesday Curry Night (Curry & a pint (or drink of your choice) for £10 only and our daily take away. Breakfast for non-residents is available 8am-10am. We look forward to welcoming you. The King William was delighted to host 3 aspiring young golfers during their time at Hunstanton. Pleasingly, all three players made the 'cut' with the top 60 players progressing to the 3rd and 4th days. From Lille, France we welcomed Mathieu Caron and his father Christoph. With scores of 74, 76, 78 and 74 Mathieu finished a highly creditable 50th. In 15th position was a young Englishman from Swindon, Jake Bolton, with his father Mark. Jake shot 71, 77, 71, 70 and was delighted to hear that he had been selected for England's forthcoming Under 18's Tour to Canada. Congratulations Jake. Topping the lot young Oscar Teiffel from Gothenberg, Sweden, started the final round in joint first position and ended the tournament in third place. On his bag was his younger brother whilst his father Peter walked all 4 rounds - sometimes in the presence of Nick and our elder Labrador, Max. A fantastic performance by Oscar with scores of 71, 69, 68 and 72 leaving him on 8 Under Par for the Tournament. It was an absolute pleasure to hoste three such talented and modest young golfers (and their dad's) . I hope that one day we can welcome them back to The King William and Hunstanton GC. Names to look out for !! Summer is here!  time to get your sunnies out and enjoy the great outdoors. Lazy days down by the beach and warm evenings with a chilled glass of wine in hand in our beautiful garden. Choose a cooler spot indoors or stay in one of our spotlessly clean, luxury award-winning bedrooms. You have complimented us so many times on the impeccable cleanliness .................. CLICK HERE to read our latest news and some great ideas on what to do during your stay. We are delighted to welcome Lewis back as our resident pianist on Friday evenings in July. There is nothing quite like dining against the backdrop of live classic piano music. Please secure your table in the Garden Restaurant and/or conservatory restaurant to get maximum enjoyment out of Lewis' play. The 1st XI squad from Greshams School Holt went to Barbados and played 4 matches against local School and Club opposition. Won 2 and lost 2, although both losses came in high scoring matches. It was a pleasure to support them by sponsoring their training kit as shown here at the Kensington Oval Barbados. The new Spring newsletter is out! lanterns................... CLICK HERE to read our latest news. It is always wonderful to hear you have done well and we are really proud to have received a 9 out of 10 certificate from our Booking.Com guests. 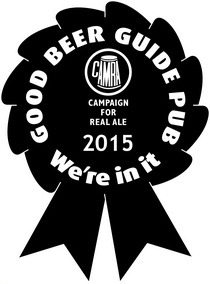 Congratulations to all of the team at The King William. Our guests enjoy our staff, the real cleanliness and our lovely food. Well done to all and thank you to our lovely visitors for rewarding our efforts. We have been voted Top Rated in the laterooms simply the guest awards 2016! We are really proud to have received another accolade. Being Top Rated in the LateRooms.coms Simply the Guest Awards is a fantastic recognition as it is the UK's only hotel awards based purely on genuine guest reviews. very special, high quality dinners with provision of freshly prepared local ingredients. Well done to Chris & his Kitchen Team! Congratulations to Mrs K. Carter. You are the lucky winner of a £25 restaurant voucher.  Thank you for choosing The King William IV and taking part in our quarterly Restaurant Prize draw. Announcement of the Winner of our Norfolk on my mind competition. Many congratulations to Mrs. S. Turley for winning the exciting competition in the June edition of the Norfolk On My Mind magazine. 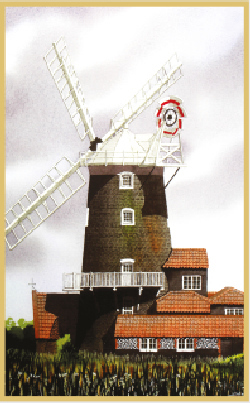 She has not only won a night's bed & breakfast for two people sharing luxury en suite accommodation but also a beautifully framed print of Cley Mill by local artist, Marty Griffin. We are really pleased to have achieved another 5 star food hygiene rating for 2015. Well done to our kitchen team for being great professionals in how they operate, clean and manage the kitchen. We are delighted to welcome local artist, Marty Griffin, to the Gallery Restaurant with his delightful watercolours. With a background in construction, Marty has always been required to sketch and though he is naturally drawn to buildings and structures, he also enjoys capturing the local countryside and coastline. Feel free to browse and purchase any of Marty's paintings at the exhibition. Out of over 50.000 pubs in Britain, only 4.500 of the finest outlets for real ale have been chosen for inclusion in the Good Beer Guide 2015. Its a great achievement year on year by our Front of House Manager Liz and Bar man Ralph. Well done! Every week we offer a new guest ale for you to try and enjoy.